Equistro Flexadin UCII is a new oral joint health supplement for horses. 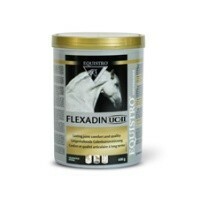 Developed by Vetoquinol Flexadin UCII is recommended for athletic horses requiring optimal joint health and mobility. Containing the revolutionary new ingredient UC-II, one of the most effective and influential ingredients available that aids and supports healthy joint function. UC-II is a native biologically active type II collagen that is highly bioavailable and beneficial in maintaining the health of equine joints. Type II collagen is the principal structural protein in cartilage making it responsible for its tensile strength and robustness. This highly palatable powder supports hyaluronic acid from the effects of oxidative reactions and helps conserve synovial fluid viscosity, while maintaining the structure of proteins in the body and aids in maintaining the immune system. Up to 60 days supply. I now have both my horses on this and would highly recommend! The difference after the first two weeks was amazing and they are extremely happy on a reduced dosage (following the loading period). Expensive product but well worth the money. Really good product which has had a fantastic effect on my horse who has quite a lot of arthritis in both her frontlegs. But this really works and has almost done wonders for my 22 year old wonderful horse.